I thought that making a wishlist post would be a quick and easy thing to do...Apparently not. I definitely underestimated how long the whole process of creating the collage would take. *Side note - Do not pay attention to the fact I obviously can't count*. After Sunday's outfit post (Which you can read here) I couldn't help but continue my obsession over this throwback trend. 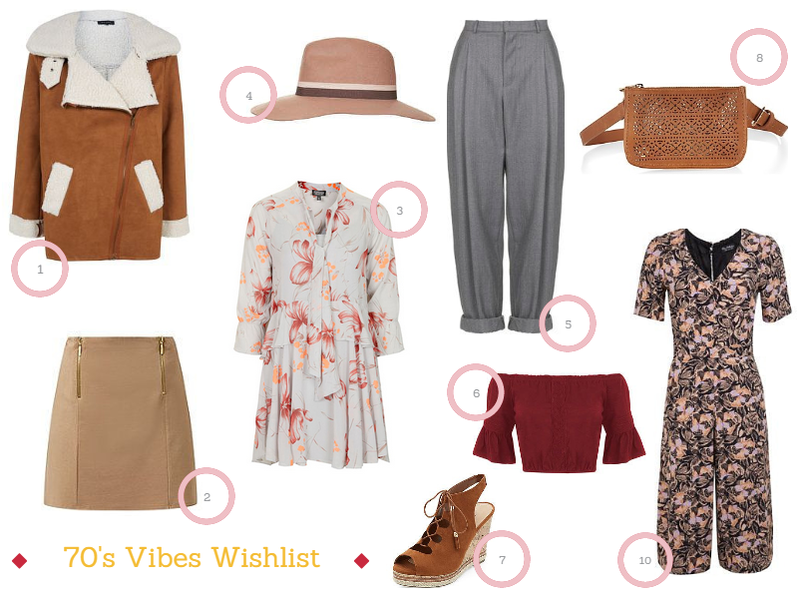 Here I've rounded up a nice little selection of 70's inspired gems that I'm lusting over right now. As you can see, Tan/Camel is a key colour this season especially in the form of Suede or Leather. I think it's a perfect way of softening things up as we head into Spring and a great alternative to black. In true Not So Plain Jayne style there is, of course, many a pink hue running throughout the collection. Mostly consisting of warm blush tones. I particularly love this pink fedora from Topshop. It's so unique and would fit perfectly into my everyday wardrobe. Flares aren't only for trousers you know! Bell bottom sleeves are just as fashionable and are far less hazardous when it comes to walking up stairs. Gypsy style is going to be huge so go grab your off the shoulder tops quick! I think the one pictured above would look incredible paired with these Topshop Boutique tweed trouser and a pair of court shoes. Unfortunately There's no way I can afford them at £85 so I'll be on the hunt for a cheaper alternative - let me know if you find any! So there you go, here's my current wishlist! If you want to see more then when not go ahead and check out my Pinterest?